Three Times a Charm is a weekly feature that spotlights authors, illustrators, bloggers, agents, editors or promoters or COMICS! from the publishing industry. This week artist/writer, Jack Kent, joins us. I met Jack and his wife, Verity at the Northwest Author Fair. I’m so excited that he’s visiting because he does COMICS. Just knowing him makes me feel a little cooler! Okay, I’ll cool it with the fangirl attitude. Welcome, Jack. Can you tell us a little about yourself? 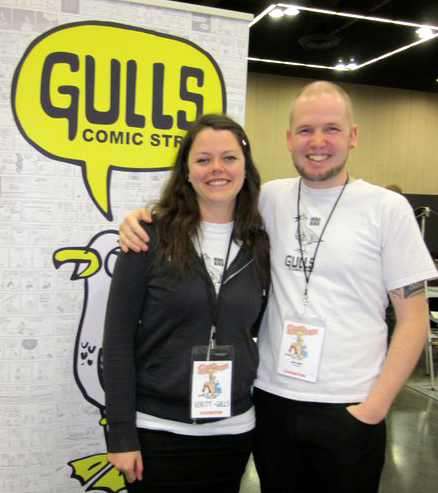 Gulls Comic is about a rag tag group of shorebirds and their daily adventures. This is a daily comic strip created by Jack Kent who grew up on the Oregon Coast. 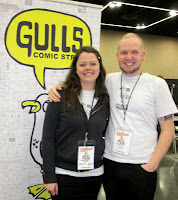 Gulls Comic is all ages, they mind their language and are here, like you, for a good time. Join the zaniness with these wacky Gulls and their buddies every day. Book mark the website and join the flock! Daily! That must be so hard to keep up with. But I remember the books you were selling at the author fair. What’s your latest? 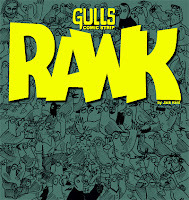 RAWK is the third Gulls book. The collection has comics from March of 2011 - December of 2011. 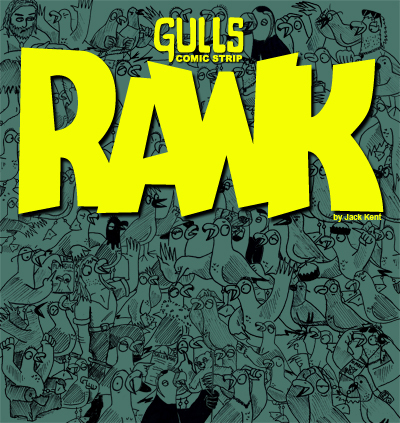 The book is black and white, 94 pages, and can be purchased through the gulls website. The Gulls are so cool! You guys have to check them out. I love a lot of music. Over the years I’ve played in many a band. Ranging from heavy metal to acoustic pop and just about anywhere inbetween. I’ve played bass, a little Piano but currently I am a lead singer and lead guitarist. Music is my first passion. I like art because it’s a one man band. I can pick it up and take it anywhere I want to go. My nerd side is in full effect. D and D is a great place to hang out with all my buddies and goof off. It’s a great mind set of creativity. It really helps my writing skills. My wife is more into D and D than I am which keeps me even more into it. We usally BBQ and make a day of it. It’s a lot of fun. I am a jock at heart. I love Basketball and am a huge Trailblazers fan. On the side I write a Blazer blog called I Bleed Blazers. I snowboard, skateboard, play kickball, bowl and to mix the D and D fantasay with sports, I also just got into fantasay football. His most famous work being the creation of the Addams Family. His macabre humor throughout his artwork is what draws me to his style. His water color/ink wash style was so complete and detailed but always held the cartoon element along the way. A great mix of subtle but genius writing. Not one to be overlooked. Less is more with art of Larson’s The Far Side. This one off comic strip is probably my all time favorite. Gary’s zany humor matched with his simple ‘sketch’ line drawings are a perfect match. My all time favorite cartoon character is Bugs Bunny. I feel this is a great blend of Gary Larson’s zaniness matched with a similar style to Charles Addams. Looney Tunes taught me a lot of cartoons as well as history. Amazing colors and episodes poured out of the Warner Bros. camp over the years. They stand the test of time. I know this selection seems really hoitey toitey but I love this soundtrack. When this song gets around the minute thirty mark it really begins. It’d make a most awesome piece of music to sample and rap over, truly it would. As for me, I’ll just draw to it. I am a metal fan. I nerd out about this genre of music. Queensryche (from Seattle) are one of my favs. This song is my motivational anthem. When I get tired of doing Gulls Comic I put this tune on and I am back at it. It’s a clichéd theme of seizing the opportunity but it works for me. I know this isn’t a song, but it’s what I listen to every day while I draw Gulls Comic. Adam has great guests and segments. His zany humor reminds me that no matter how old you are, don’t lose your childhood inside. He’s crass, crotchity and crude, just what I need to start my day. Jack, your answers are making it really hard for me to supress my inner fangirl. If you drew supers (villains/heroes) I’d be a goner. Thank you for joining us on Three Times A Charm, this week. It’s been great getting to know you. Continued success with your work! It's great to meet Jack. It'd be cool to make comics. I'm blown away over the daily aspect of a it! DAILY. Hard! I'm QR crazy! I want to paper the town in QR Codes. I want a tshirt. My life will never be the same. Ha ha.